So, the rumors were accurate - Sony has actually developed the world's first 4K2K (3840x2160) OLED TV panel, and unveiled a prototype unit. The panel is 56" in size and uses an Oxide-TFT and Sony's own "Super Top Emission" OLED technology. Sony wouldn't reveal any technical specification - they only said that this panel "delivers all the features expected from OLED TVs, such as high contrast, brightness, rapid video image response time and rich images produced even at wide viewing angles". But that's just as well - Sony wouldn't say anything about a release date (or expected price) of this display either. They just said that "Sony will continue to research OLED technology with the goal of commercializing its new 4K OLED televisions". Perhaps Sony's collaboration with Panasonic indeed focuses on new production technology, and in the meantime the company is also developing larger panels based on their current process, together with AUO. Hopefully we'll learn more soon. Last year at CES Sony unveiled a new slef-emitting LED technology called Crystal LED. Back then Sony said they will develop this technology in parallel with OLEDs and bring Crystal LED TVs to the market. But this year Sony is not showing any Crystal LED prototypes, and in fact we haven't heard anything about this technology in a year. Perhaps Sony decided to abandon this tech and focus on OLEDs. 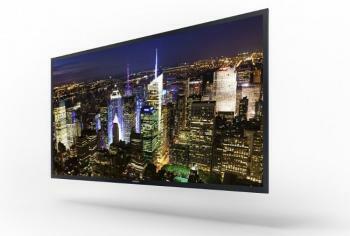 Will Sony unveil a 4K2K OLED TV at CES 2013?